Golden Ridge Stables has been teaching Minnesota to ride since 1986. We offer an excellent lesson program for novice riders all the way to those who aspire to show ring success. In addition to our dynamic instruction, we also offer a unique leasing program, and personalized boarding for our client's horses. Golden Ridge Camp provides each child individual attention and structured riding lessons, all while campers learn fascinating facts about their horses. Your child will discover how to safely work with his/her horse on the ground as well as on its back in a “hands and seat on” environment. We ride rain or shine in our safe, clean indoor facility. We are available to answer your questions and understand the concerns of parents and horse owners. 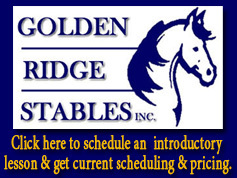 Golden Ridge Stables strives to provide a safe educational riding experience for our customers and quality care for their horses all at a reasonable and affordable price. Website Designed and Hosted by Quick Draw Solutions.